This week - I just wanted to write out this text in entirety. It speaks deeply and powerfully by itself. I thought I'd be "done" with these posts about this book a few weeks ago...but I keep finding nuggets that resound with and challenge my own life/heart/ministry. I figure if they're stirring me - they might be also helpful for you. 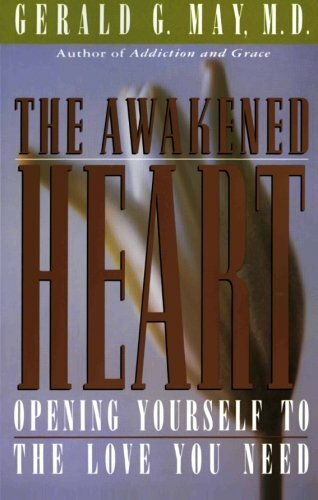 So here's the sixth musing on The Awakened Heart: Opening to the Love you Need. "Many people have burned out in ministries of service and social action precisely because they have been worshiping their own activity instead of God. In such instances, burnout can be a blessed time that perhaps should not be forestalled. Like the rock bottom for the substance addict, burnout for the action addict is sometimes the only way he or she can come to know the difference between the means and the end, between good deeds and God. "It is the authenticity of how these means come to us and the honesty with which we receive them that makes the difference. It is a true attempt to be present to God through a sense of relationship, I do not just try to be loving because it is what my religion tells me to do. Instead, I feel a deep desire for that lovingkindness - for more than I could ever create on my own. I do not look for God because I think it is what I am supposed to do; I do it because I need to, because of a longing that is not of my own creation. And though I often do try to substitute my actions for God because I can control my actions better than I can control love, I keep discovering that no good activity, no right attitude, no set of rules, no good feeling will ever satisfy my real longing for God. And now and then in those especially graced moments, a flash of truly unconditional love bursts through me (189). Yes, yes, yes. Not much more to say - but I remember sitting in a ministry team meeting once and we were studying Philippians 4 where it says, "Let your gentleness be evident to all." And one man, sharing what he wanted to take away from the passage said with fierce and rather vigorous fervor, "I NEED TO REMEMBER TO WORK REALLY HARD TO BE GENTLE!" I could feel my insides recoiling..."Please don't." I can only be gentle if I've experienced a gentleness that has come graced in a moment when I have been harsh with myself (or others). I cannot force gentleness...ew. The very thought of it makes my face wince. And when I "force" love or "force" seeking God or "force" doing good" - it will always come across as inauthentic. Most missionaries and pastors I know actually burn out less because the work is hard (and it really is) - and more because of the disparity of inauthenticity in trying to make the work be what is rewarding vs. God's love. I pray for more and more "especially graced moments" - where ministry and social action are less forced and instead just flow from what has already been received. And when they do - they bring grace, and healing and liberation that is far beyond what you or I could create on our own. Have you ever experienced a "burn out" in ministry or social action? Serving at church? Volunteering for a non-profit? Describe what the burn out feels like and is doing to your heart? Your relationships? Your view of God and yourself. For any or all of you who ARE experiencing burnout currently - in what ways can you see this as a grace-gift; an invitation to remember that the activity is not the end goal. If you haven't listened to yesterday's podcast - it dovetails with this nicely.